Friday was a hard day for me. But I did not fail to notice the beauty of the nature around me during the day. At the door of the doctor’s office was where the first picture was taken. 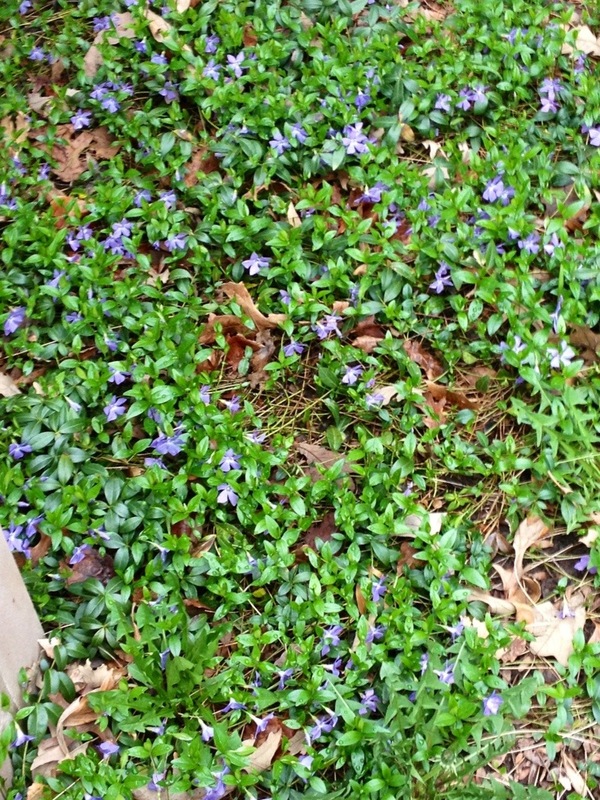 In a shady corner near the door, the small patch of grass was covered in tiny purple flowers. Purple is my signature color. So the ground cover made me smile. Hours later as I left, I noticed a large grape hyacinth in full bloom. My Grandma Kennedy loved hyacinths. I would always cut some out of our yard and give them to her in a bud vase for Easter. I took seeing these as a sign that she was watching over me. I believe she has become my guardian angel since she passed because she sends me signs that she is there. 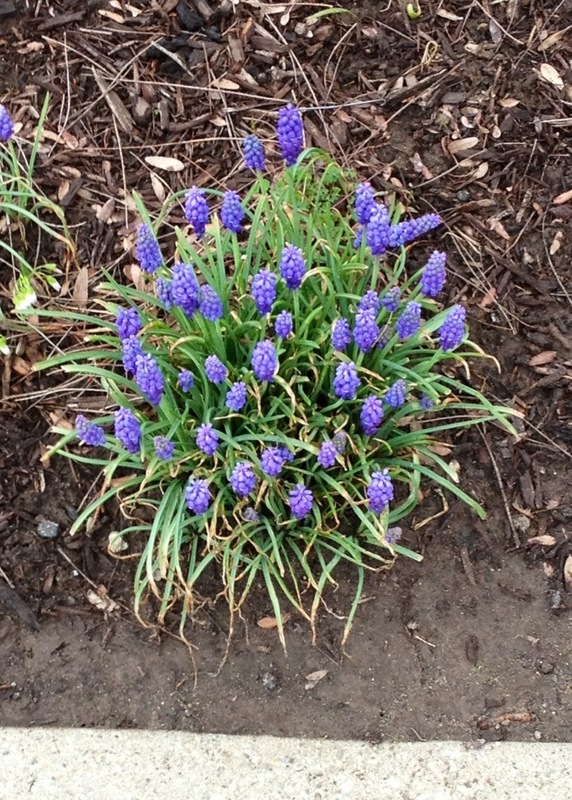 I believe the grape hyacinth was a sign because I had been to that same doctor only a few days earlier and there had not been a patch of purple flowers there before. I do choose to find meaning in these small things. I think I would miss her so much more if I never saw the heron or didn’t notice a huge bloom of grape hyacinths growing next to the sidewalk. I got really hard news at that doctor’s office that day. The next few months are going to be hard too. I am glad I have a strong guardian angel to look out for me. And I am glad I can find such spirituality in Nature. Today my Grandpa turns 80. I just wanted to wish him a Happy Birthday today. He has always been an amazing man in my life and I love him very much. He has always been someone I looked up to. So I hope his day is cheerful and bright today. Tonight I was reminded of a great memory while watching T.V.. My Grandma Kennedy passed away 2 years ago but the thing I remembered was from a long time ago when I was a little girl. My Grandma and Grandpa Kennedy had 10 kids and they used to have a huge house big enough to hold them all. When I was a little kid this big house was like an amusement park for me. I was the first grandkid too, so my Grandma tried to spoil me whenever she could. I used to get to spend weekends with them all by myself and now I realize how special those moments were. My Grandparents used to have dinner parties and afterwards they made all their friends drinks. Now you have to realize that we are Irish Catholic which might as well be a symptom of alcoholism in my mind. My Grandma could not have made a froo-froo fruity drink if her life depended on it. So I would watch as she made real drinks for every single adult in the house after eating a huge dinner which she also prepared. And she would look down at me, because I was only knee height at the time, and ask what I was hanging around for. I would say that I was waiting for my drink. I mean everyone else had one and I thought that should include me. So my Grandma would ask if I wanted a Shirley Temple. And I would squeal to the affirmative. I loved and still love today Shirley Temple. And I assumed that a drink named after her had to be a drink she drank all the time. And my Grandma put no less work into my drink that she did the others. She would take a martini shaker and pour in 2 shots of 7-UP and 2 shots of Sprite. She would throw in some ice cubes and shut the shaker. She would shake up my Shirley Temple and pour it into a short old-fashioned drink glass. And then she would take 2 maraschino cherries from the jar and drop them into my drink. Last but not least she would put in a red drink stirring straw and put it on a fancy napkin. She would carry it into me at the table in front of everyone. It was one of the few times in my life that I remember a whole room of people looking at me without my face turning bright red. Maybe I was too young to feel embarrassed. Maybe my Grandma just made me feel special and not guilty that she was treating me special too. There are more days in my life now that I barely remember feeling special. I am glad I have memories of my Grandma to remind me of what special feels like. I miss her so much. Maybe I will go make myself a Shirley Temple and remember her some more. So I have noticed that many people I know are blogging everyday this month things they are grateful for and I have loved reading them so much. If only I was that diligent, sigh. And wouldn’t it be nice if we all did that everyday of the year not just because of Thanksgiving. But I think as long as we notice that we have things to be grateful for, no matter when or how often, it is a very good thing. Sometimes I find it very hard to see the positives that happen each day in my life and I know my days are often darker because of that. So I am trying to change and what better holiday than Thanksgiving to make my new start! I am very thankful for the people in my life, especially my family and my friends that have come to be family to me. Where to start, there are so many? My own world is very small and often limited. That is where all these people come in. They share their lives with me and through them I get to be part of a much larger world. And often a world I would never get to experience otherwise. So here come the “Thank you”s. I ‘ll start with the Kennedy side of the family. The loudest squeaky wheel gets the oil right. And boy are we the loud ones. My Mom’s side of the family is absolutely amazing. We are so many and so varied. I was so lucky to get to grow up seeing my very large family very, very often. And I am so thankful to my Grandma and Grandpa Kennedy for that. Probably a little bit more Grandma than Grandpa because she did the party planning and cooking. We got together for so many reasons. Not always all of us but always some of us. I am grateful for every Christmas, St. Patrick’s Day, Fourth of July at the lake, wedding, first communion, baby shower, graduation, school play, and even a beauty pageant or two. I have loved watching my Aunts and Uncles get married and have babies. I loved annoying my Uncle Mike at the old big house. He was still a teenager when I was young and everything he did was so interesting to me. He used to mix together multiple colognes to wear before a big date. Although I probably shouldn’t remind him of that. And when I was really annoying him and touching all his stuff in his room, he would forbid me to come through his door frame. So I would stand in the hallway and talk at him and talk at him and talk at him until he let me back in. And one time when I was sick and Grandma was baby-sitting me, there was a 48 hour Andy Griffith Show marathon on TV. ANd my wonderful Uncle Mike forced me to watch all 48 hours! To this day I cringe at the notes of the whistled theme song. And some of my Aunts were also young enough to still be living at home then. I got my first make-up lessons at age 4 or so from them. I loved every second of it, but Grandma would always make me take a bath and wash it all off right after for some reason. Probably because I looked like Avon exploded on me but I am so thankful for all those memories. I am so thankful for all the time I got to spend with all my Aunts and Uncles. And then came all the cousins and they were even better. What kid had 28 other kids to play with and grow up with and love right there at their Grandma’s house? I have so many wonderful memories of growing up with all my cousins that it would take me a journal the size of the Empire State Building to write them all down. We had to take huge group naps when we were young after lunch at the lake house. Try getting 20 kids to lay down and be quiet for 30 minutes in the middle of a beautiful sunny day in the summer. One family Christmas the snow had all melted and the ground was a complete mud pit. All the boys went out to play outside and got so muddy that Grandma made them strip down to their undies and sit on the floor in a group while she washed all their clothes. It was like 20 little boys in undies and socks and frowns sitting on the floor while everyone else just laughed and went on eating and stuff. And I have pictures of it!! And I am extremely grateful for the summers when my brother and I would go visit Joey and David at Uncle Joe’s house. Joey and David had bunk beds and we had the most fun times at night when we should have been sleeping. Joey and I would be in the top bunk teasing Tommy and David in the bottom bunk. Uncle Joe would come in at least four times a night to yell at us for not being asleep. And in the beginning I had only boy cousins, so when Christy and Lauren came along I was ecstatic. I begged to baby-sit them and hold them all the time. I about dies waiting until they were old enough tho play with. One time when I baby sat for Joey and Christy and Lauren and Nick, I had brought pillow cases and the girls and I decorated them and made them into dresses. I have millions upon millions upon millions of memories like these that I will always be grateful for. And now my cousins are finding their own ways in the world and getting married and starting their own families. And I am grateful that they share their lives and experiences with me because it make my life fuller. And I am grateful for all the weddings and baby showers and first communions and graduations and Christmases to come. And full circle to where it all started, my Grandma and Grandpa. My Grandma was amazing. We were all always together because of her. She was our fearless leader. Some of my best memories are of mornings at the old big house. I would wake up and sit at the top of the stairs and just listen. I was waiting to hear the sounds of Grandma cooking in the kitchen downstairs. Once I heard that I was downstairs and at the breakfast table in 2 seconds flat. The chairs of that table had wheels on them and I was rolling all over the kitchen while poor Grandma tried to make breakfast. And my Grandpa was sitting there watching Regis and Kathy Lee, getting ready to go work at the hospital. Every morning he had a piece of toast with a slice of Canadian bacon on it, cut in half, with coffee for breakfast. And I mean EVERY morning. And Grandma would make me blueberry pancakes from scratch, which might have well have been magic to me. I am so thankful that I have memories of my Grandpa before he was so sick. I remember swimming with him and going on boat rides with him and I remember he used to make this ducky-quacky bird noise at me that would make me giggle. I am very grateful for the memories I have of just his face smiling at me. The memories of my Grandma that I am most thankful for actually happened as I got older. When I was young we spent time alone together very often because I was the first grandchild. As I got older we spent lots of time alone together because I was close and we had the same schedule of free time. We had lunches and sleep-overs and trips to the lake in the middle of the week. I cherish those memories. We got to know things about each other that I don’t think we would have otherwise. She was making efforts to understand the symptoms of my illness and she would tell me stories about when she was a kid. And she would confide in me things she wished she had done in her life. And I was trying to teach her all about new technology. We had decided she would go on Wheel of Fortune and I would go on Jeopardy, and then use our winnings to go on a trip together. We went to Culver’s every single time we had lunch together. She would order just a sandwich and I would get the meal, because she knew I wouldn’t finish my french fries so she could have them. Little things like that I am grateful for. I am most grateful for the quarter she gave me every time we went to church together to put in the collection plate from the time I was 3 until I was 30. 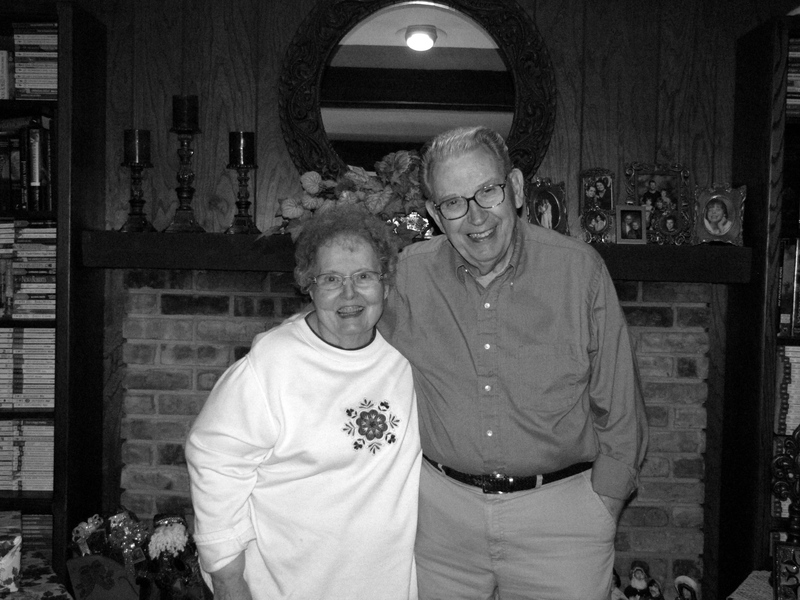 I miss both my Grandparents very much now but I am so extremely grateful for all the parts they played in my life.